If you’re not familiar with Anil Prasad’s website, Innerviews, you should be. Anil created it in 1994 as a home for his in-depth interviews of musicians who span an amazingly diverse range of styles. He says it is the web’s “first and longest-running music magazine,” which I don’t doubt. After all, 1994 was the year that Netscape Navigator–the first popular Internet browser–was introduced to the public. Very few websites of any kind go back as far as Innerviews. Anil’s interview style lends itself to revealing portraits of his subjects. It starts with superb preparation and research; Anil is incredibly informed about his subjects, and I’m sure this goes a long way toward establishing a basis of mutual respect between interviewer and interviewee. But that’s just a starting point. Anil asks probing, open-ended questions that give his subjects plenty of room to express themselves in intimate and candid ways. The website format frees him from the word count constraints typical of print publications, making for expansive conversations. And because Anil’s interviews are not driven by the marketing needs of record companies, the conversations get to the heart of what is important to the musicians themselves. I’ve read and collected a tremendous number of Zawinul interviews and articles over the years, and when I read Anil’s 1998 interview with Joe, it immediately stood out as one of the best, if not the best. 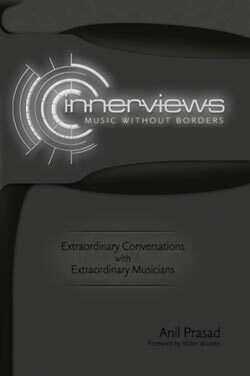 That interview and 23 others are now collected in the book Innerviews, Music Without Borders. In addition to Joe, artists featured in the book include Jon Anderson, Björk, Bill Bruford, Martin Carthy, Stanley Clarke, Chuck D, Ani DiFranco, Béla Fleck, Michael Hedges, Jonas Hellborg, Zakir Hussain, Leo Kottke, Bill Laswell, John McLaughlin, Noa, David Sylvian, Tangerine Dream, David Torn, Ralph Towner, McCoy Tyner, Eberhard Weber, Chris Whitley, and Victor Wooten. • Zawinul on the creation of the hip-hop beat. A few of these interviews originally appeared on the website, but most are new for the book. It is not an overstatement to say that Anil’s book is a significant contribution to music journalism. I highly recommend it.